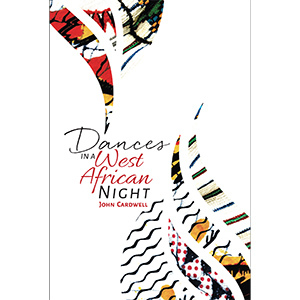 John Cardwell says he packed 30 years of living into his few months as a young visiting college teacher in Nigeria in the 1970’s, and the reader of Dances in the West African Night will know the feeling. This ambitious and evocative book weaves the bright threads of a Hoosier’s transforming experi­ence into a resplendent agbada of poems, photos, annotations and fact-based fiction. Through what is essentially an autobiographical novel, Cardwell walks and races us through the beauty, promise, danger, customs and commerce of a bellwether of modern Africa at a critical and tumultuous moment in its history. It’s an adventure with heart and mind, Indiana Jones as the Innocent Abroad.